July -- 1/2 way through the year already, and time to start preparing for Christmas! Right? If you're a card maker, it's never too early to start on those cards! This card uses Di's Digi Design's Poinsettia Mouse. It is available in both a colored and a black and white version. This is the black and white version of Poinsettia Mouse, colored with Copic markers. Papers on this card are from We Are 3 Digital Shop. They are the Kerst Christmas Collection. The dies I used to cut out and back Poinsettia Mouse are from Die-namics dies. The edger dies are from Hot Off the Press. The ribbon on the card is from Really Reasonable Ribbon. Di's Digi Stamps has the absolute cutest digis and stamps. 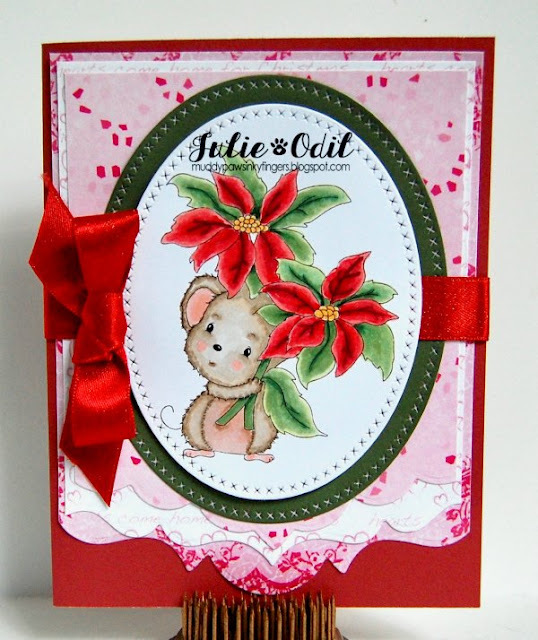 Join in at Di's Digi Designs Challenge blog and you may win some for yourself! Julie, this is gorgeous! Great image. This is adorable!! I just got this image and I love it; so adorable!! Love your fun layout and the dies you used!